What does it take to be a Brave Ski Mom? I recently chatted with fellow ski mom Kristen Lummis, Brave Ski Mom, in Colorado about her love of skiing, family times on the slopes and her fantasy ski trips! Q: So Brave Ski Mom, is bravery a necessary trait for moms wanting to take their kids skiing? I think bravery is a necessary trait for all parents. Having children requires a leap of faith, a step into the unknown, into a realm so filled with love and yet so challenging that all parents have to be brave, each and every day. More to the point with skiing however, I think that ski moms are special. We love our children and we’ll protect them with our lives. But the moment they can walk we put them on skis and push them down a hill! When they fall, we brush them off and encourage them to try again…over and over again, hoping that this will all pay off. I’m here to tell you, it does pay off! And then the tables turn. Suddenly, our children can out ski us, and now we’re the ones challenged to keep up, pushing the envelope on our skills. Yep. You have to be brave! Q: What do you love about the sport of skiing? I love skiing for so many reasons. I love the cold. I love the speed. I love the ever changing challenges. I love the pride I feel in watching my sons’ grow into outstanding athletes and I love the time we spend together on chairlifts. I love trying to carve perfect turns and the rush of trying to ski a fast, tight bump line. Most of all, I love how skiing is passed down through families, from parent to child. Skiing is one of the few sports I can think of that is truly a multi-generational, lifetime endeavor. Q: You have a family of skiers, has being a ski mom made motherhood better or difficult? I truly believe that skiing together brings our family together. Skiing is bond we share and that we enjoy doing as a unit. Especially as a mother of two boys, I love that we have a sport we can share and participate in as equals. This doesn’t mean that we’re always skiing together. But at the end of the day, even if we’ve been apart, we join back up to share our stories. This has been especially important as our kids hit their teenage years. Skiing has given us a portfolio of shared memories to draw on when things get difficult. And it gives us a new way to create more memories each day. This is not to say that it’s all been rainbows and unicorns! When our oldest son was 11 he was in a ski accident that resulted in an investigation lasting nearly five months. As a parent, it was an incredibly difficult time in my life. In the end, everything worked out, but it was painful for us all. Q: Some parents say skiing is “too much work,” “too expensive,” or “too dangerous”? What do you say to them? ? One of the primary reasons I started my blog was to help other families get out there and ski. There is no disputing that family skiing can be a lot of work. It certainly takes a lot of gear and organization. It also takes a lot of patience. But there are tricks and tips for getting organized and staying organized (the always packed and ready to go boot bag, is one), so that a ski day or ski vacation doesn’t have to be too much work. 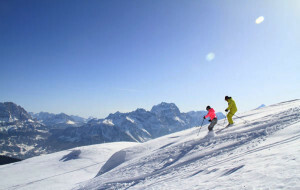 There are also ways to save on ski passes and take some of the expense out of the sport. As for the danger, I’m all about managing risk. Don’t start your kids off too fast on a slope that is too hard. Not only does this increase their risk of injury, but it is counterproductive and may increase their sense of fear. Skiing is a skill, and like any skill, it is best taught by professionals and learned incrementally. Sure accidents can happen, we’re living proof of that, but they can happen on a bike, in a car or running across the school playground. Q: What’s your goal with your Brave Ski Mom blog? Who do you hope to reach? My goal is to inspire other families to get outdoors and enjoy winter! My audience is largely moms and dads with kids of all ages, who are looking for tried and true tips, advice to make each ski day easier, and unbiased reviews of resorts, from a parent’s point of view. One of the reasons I started Brave Ski Mom was because my friends kept asking me questions like “how do I know when my child is ready to ski, how do we pick a racing club, what kind of mittens are the best,” and so on. I realized that our family had a lot of information, drawn from our experiences, that we could share. Q: Do you have a home mountain? Where do you ski most? Living in Colorado, I have several home mountains! The resort nearest our home is Powderhorn Mountain Resort, a Colorado “Gem” where we can always meet up with friends and where we enjoy skiing the trees and the often, quite deep powder. Since the boys began school, however, we primarily ski at the Aspen/Snowmass mountains. Aspen offers kids in our school district a season pass at a very low cost. It’s an easy drive to all four mountains, with amazing terrain. Q: Where would choose for an all expense paid, month long fantasy ski trip? I’m torn on this one. Europe or Japan? Europe has such an appealing skiing history. I am intrigued with Austria, France and Italy, not just for the amazing terrain found in the Alps and The Italian Dolomites (not to mention the Pyrenees), but also for the food! I like the idea of long lunches and hectare upon hectare of terrain to explore as we move from village to village. Japan however, has that amazing powder and the lure of a completely different culture. In another life, maybe I was one of those Japanese hot tub monkeys. I love soaking that much! Can I have two fantasy ski trips? Please? Q: Why be the brave ski mom, not the brave shopping mom, or the brave bike mom? or are those future blogs? Well, perhaps if I’d had girls, I’d be more of a shopping mom! But with boys, no way! Being the Brave Ski Mom is a good fit for me, because skiing, snow and winter are truly my passions. I am lucky to have a husband who largely feels the same way, although truth be told, he’d probably prefer that I focus on biking! Even more, I am so blessed that my children share my passion. Together, we have the most amazing adventures. As for future blogs, I’m starting to think about that. My boys are in high school and we’re beginning to envision what life will be like without them living with us. It’s both exciting and frightening!